If you plan to hire new employees this year, you're not alone. Employment statistics ended 2015 on a positive note. In addition, roughly 242,000 new jobs were added in February and the unemployment rate fell to 4.9%, its lowest level in eight years. 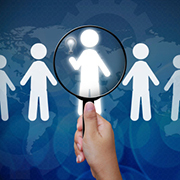 Several recent studies indicate that the hiring momentum will continue in 2016. In general, the credit applies to only the first $6,000 of wages. But there are a number of exceptions, which we'll discuss a little later. In addition, you may qualify for a credit of 50% of qualified second-year wages (in addition to first-year wages) if you hire someone who's certified as a long-term family assistance recipient. Here's an example illustrating how this credit works: Suppose you hire Fred, a qualified veteran who was unemployed for six months before you hired him. He works for you for nine months and earns $500 per week, which equates to $19,000 in the first year. An added bonus is that Fred falls into a special targeted group of veterans and, based on his circumstances, he qualifies you for a credit on his first $14,000 of wages. Important note. Typically, a credit will provide greater tax savings than a deduction of an equal dollar amount, because a credit reduces taxes dollar for dollar. A deduction reduces only the amount of income that's subject to tax. There's no limit on the number of eligible individuals your business can hire. In other words, if you hire 10 people exactly like Fred, your credit would be $56,000. Work Opportunity credits generated by pass-through entities, such as S corporations, partnerships and limited liability companies, pass through to the owners' personal tax returns. If this credit exceeds your tax liability, it may be carried back or forward. You also can't claim a credit on wages paid while you received payment for the employee from a federally funded on-the-job training program. And you can take the credit only if more than 50% of the wages you paid an employee were attributable to working in your trade or business. The IRS is currently modifying the forms and instructions for employers that apply for certifications for hiring long-term unemployment recipients. But it's expected that the modified forms will require new hires to attest that they meet the requirements to qualify them as long-term unemployment recipients. Guidance from the U.S. Department of Labor states, "In the interim, employers and their representatives are encouraged to postpone certification requests for the New Target Group until the revised forms are available." If you're planning to hire new employees in 2016, the Work Opportunity credit offers a simple way to lower your tax liability. It doesn't require much red tape, except for obtaining a timely certification of the employee from your state employment security agency. Your tax adviser can help you determine whether an employee qualifies, calculate the applicable credit and answer other questions you might have. But, if you postpone applying for certification, you could lose out.